Growing up in the Southern United States, grits were a staple in my family. My mother included a casserole of grits with cheddar cheese – and sometimes bacon – at every holiday brunch or special occasion. She loved them – I did not. As a child, grits ranked on my food list right above brussel sprouts, scalloped oysters and liver. They were to be avoided at all cost, which I proudly did for more than thirty years. It wasn’t until my sister’s wedding two years ago that I began to re-examine my staunch ‘no grits – ever’ mentality. Her very Southern reception featured an entire food station dedicated to the stone-ground white corn. I was shocked. How could she serve grits at her wedding? And then – only because the shrimp looked really good and I had consumed a few glasses of wine – I tried them. What had I been missing all of these years? When I returned home, I vowed to try new grit recipes. Yet not surprisingly, grits are not easily found at the average Ontario grocery store. I quickly forgot about the gastronomic delight. It wasn’t until the same sister gave me the Skinny Taste Cookbook by Gina Homolka for Christmas this year that my interest was peaked again. So this week, while visiting my parents in Florida, I decided to try Homolka’s recipe. I was anything but disappointed. In fact, I already have grits in my suitcase ready to take home. This recipe is a keeper! Here are the directions – slightly adapted by what I had on hand. It took about 45 minutes to make and is completely doable for a weeknight meal with kids. For more yummy – and healthy eats – check out her blog at skinnytaste.com. Prepare the grits first. Add milk, water, salt and chicken broth to a medium sauce pan and bring to a boil. Stir in grits and return to a boil. 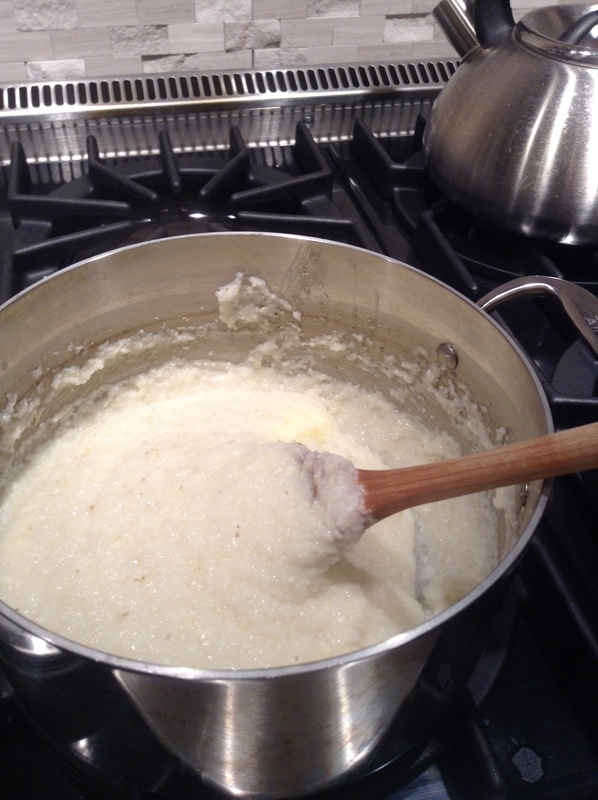 Cover grits and reduce heat to low, stirring every few minutes for 30 minutes. Stir in butter and cheese. Remove from burner and set aside. While the grits are cooking, cook bacon and set aside. Once complete, add extra-virgin olive oil and heat on medium-high. Add shrimp and sprinkle with Old Bay Seafood Seasoning. Cook for one to two minutes and turn, continuing to cook for two minutes. Transfer shrimp to a plate. Add shallots and cook until golden. Add crumbled bacon, tomatoes and chicken broth. Cook until liquid is reduced. 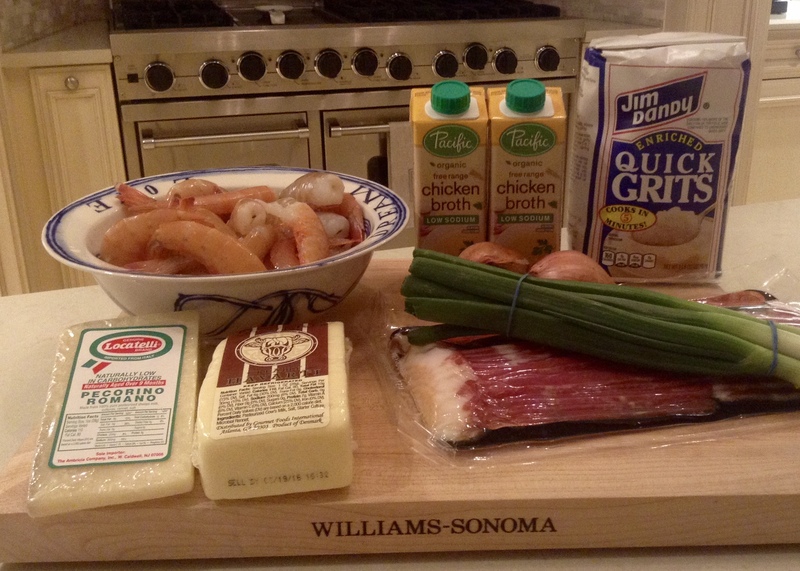 Add shrimp to re-heat. Serve one cup of grits topped with 6 shrimp, add chopped scallion and drizzle with hot sauce…enjoy! A few years ago my Facebook profile read, “family CEO, cook, chauffeur, cleaner, party planner, yoga enthusiast and volunteer.” I was part-time communicator and a full-time mom. Life was busy, messy and most of all…fun. Gone were the simple days of preparing meals at home, baking homemade muffins after school or discussing the day over dinner. Ordering takeout or picking up a meal on the way to the next activity became the daily norm. I can cook— that was never the problem— but my culinary toolkit did not include healthy 30-minute meals suitable for the weekly dinner rotation. My biggest concern, what could I prepare that my extremely picky first-born would actually eat? Should I buy organic? When would I find time to cook with a busy career and activities every night? Could I really hit reverse on our drive-through lifestyle? Purchase a weekly fruit and vegetable box —and use it! Read labels: If you can’t read it – don’t eat it! It’s been six months since we began our whole foods journey – I’m now a full-time mom and part-time communicator. I collect cookbooks, subscribe to a weekly produce box and pine over beautiful meals; however, I am still searching for that perfect weekly meal plan that everyone will enjoy, and the kids (and sometimes the parents) still negotiate for drive-through for our weekly takeout. And while I’m not a prissy, proper mom by any stretch, I now know that small steps work work best for my family. We are on our way to a fresh, whole foods lifestyle – most of the time. Next up – reducing sugar. Wish us luck…and send sugar-free recipes, PLEASE!